If you have gut health issues you know that traveling can be a doozy. I’ve been lucky enough to travel quite a bit in my life and I’ve learned to LOVE it, but I’ve always felt a bit of an apprehension each time I think of planning a trip or getaway. How will my stomach react? What will I do without my refrigerated probiotic? How many snacks can I fit in my suitcase? Will there be restaurants I can eat at there? Is there a fridge in my hotel room? How does my medication play out with the dates of the trip? Is there a grocery store close by???? Traveling, although fun, brings up a lot of anxieties for people with gut health issues. Being bloated, in pain or uncomfortable is never fun, but especially on planes and in new places. I just got back from a four-day trip to LA for the Blogher Health conference and I realized I’ve become quite the seasoned gut-health-traveler. Although it still makes me a little nervous, I now have the tricks and tools up my sleeve to make traveling smooth and (mostly) pain-free. 1. Talk to whoever you’re traveling with: whether you’re traveling with friends or family, make sure to talk to them before your trip about what you may need to help your gut stay happy and healthy throughout your trip. As I’ve said in previous gut health posts – communication is KEY! If the people around you don’t understand your needs, they can’t do anything to help you and they’ll most likely get more frustrated when you have to make special requests. Prep them before the trip so you feel comfortable voicing your needs while you’re there. 2. Pack snacks / meals: I always come prepared, especially to the airport, with an arsenal of snacks and even Tupperware meals if my time at the airport is really long or falls right during a meal time. I never like leaving it to chance and hoping I find a healthy, gut-friendly option (because let’s be real that’s really hard to find at airports). I also pack tons of snacks and other food options in my suitcase to have on hand during my trips. Confession - last time I went to Europe I took an entire food suitcase. Yup. No joke. (In my defense I was there for a month). This ensured I had options I knew would make me feel good throughout my entire trip! 3. Don’t eat too much on the plane: I’ve personally noticed if I snack too much on the plane I get extremely bloated (our digestive system becomes less efficient in high altitudes). For shorter flights I try to only take in liquids to keep my digestion in track. Of course, for longer trips this may not be an option, but be mindful that you’re eating easy-to-digest food on the plane. 4. Drink a ton of water: being dehydrated is a sure way to hurt your digestion and make your stomach feel less than okay. Plus, planes are notorious for being dehydrating, so I always drink as much water as I can while onboard (and yes I always feel bad for whoever is next to me if I don’t have an aisle seat). 5. Drink warm soothing drinks: Bringing mini bottles of apple cider vinegar (I find a travel-safe size container and just pour it in) to mix with hot water and ginger tea always help calm my stomach and keep it in check while flying. 6. Map out the grocery stores: Before I go on a trip I always make sure I know where the closest grocery stores are. Eating out for every meal simply doesn’t work for my gut, so I like knowing I can get some staples and make my own food at least part of the time (plus it saves money!). 7. Get a hotel room or Airbnb with a kitchen: On that note, make sure to get a hotel room, rental, etc. that has a small kitchenette or kitchen. Being able to cook some of your own meals with help keep your gut in check. 8. Research restaurants you can eat at beforehand: But, of course, part of the fun of traveling is trying new restaurants (especially if you’re a foodie), so my biggest tip here is come prepared with a list of gut-friendly spot you’ve already checked out. There’s nothing worse than when the question “where should we go to dinner?” pops up and everyone just stares at you and waits for you to search and find a spot you can eat at. So, come with a list ready! Make sure to check out their menus first and even call ahead if needed to make sure they can accommodate your needs. 9. Bring your supplements: If you take supplements, vitamins, etc. to help with your gut – BRING THEM. It’s easy to think “oh a few days without them won’t hurt,” but it’s always better to play it safe. I always pack them in my carry-on in case I every lost my luggage. 10. 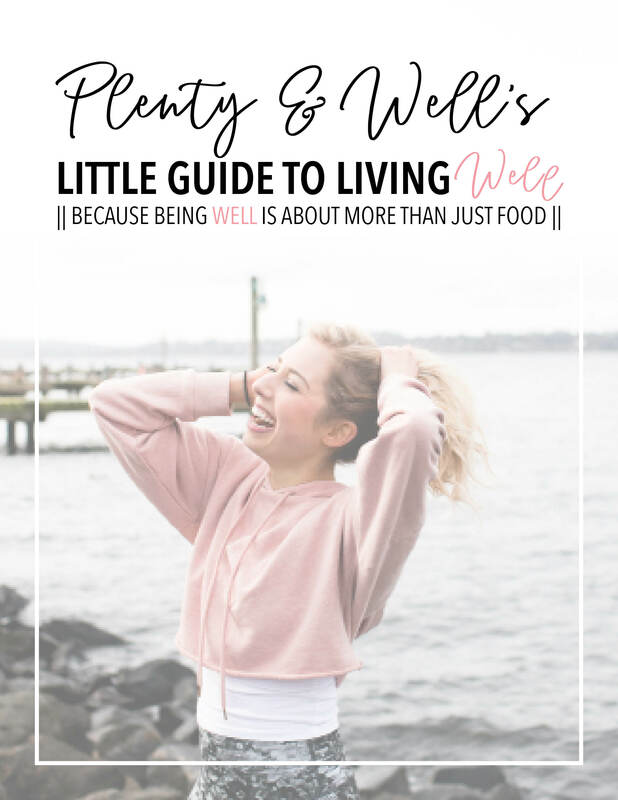 Try to stick to your normal routine: Personally, I have a morning and nightly routine that helps my digestion and gut a ton (if you need help creating one check out this post!). Making sure I have my supplements, apple cider vinegar, special mushroom coffee, collagen, ginger tea, essential oils, etc. with me helps my stomach feel like it’s on its normal schedule. Also implementing things throughout my day that I normally do, like a morning workout, also helps! The biggest thing to remember is that YOU ARE NOT HIGH-MAINTANENCE (and don’t let anyone tell you that you are). Taking these steps to keeping yourself healthy and able to have fun while traveling are necessary. If you feel uncomfortable at first whipping out your own apple cider vinegar on the plane or opening your suitcase to find that half of it is snacks – that’s okay. It takes a few times to really feel comfortable with it all, but trust me, a happy gut is so, so worth it.